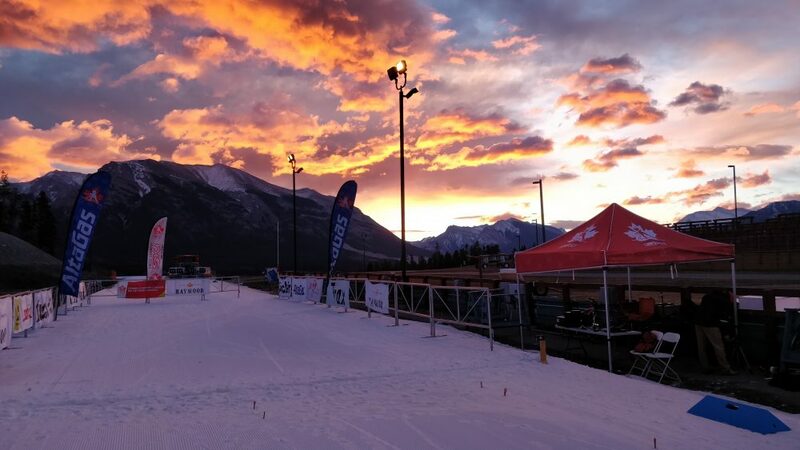 On Tuesday, Frozen Thunder at the Canmore Nordic Centre in Canmore, Alberta hosted women’s and men’s individual start freestyle races. The women raced 7.5 kilometers, the men 10 k.
Canada’s Emily Nishikawa (AIAWCA/CNST) won the women’s 7.5 k skate race in a time of 21:05.9 minutes. Nishikawa’s pacing was peerless as she skied the fastest splits at every checkpoint. Dahria Beatty (AIAWCA/CNST) placed second, stopping the clock 24.0 seconds slower than Nishikawa for a time of 21:29.9 minutes. Third place went to U.S. skier Catherine Feldman (SVSEF Gold Team) who skied the course in 21:42.2 minutes. Another U.S. skier, Dartmouth’s Lauren Jortberg, skied to fifth (+59.2), while Canadian Biathlon National team member Emma Lunder placed sixth (+1:22.5). Cate Brams (SVSEF Gold Team), also from the U.S., was sixth overall (+1:37.9). For the men, Canadian Russell Kennedy (Team R.A.D.) ran the tables at all but the first checkpoint on his way to winning the men’s 10k skate in a time of 22:18.9 minutes. Kennedy also posted the fastest qualifying time in yesterday’s classic sprint. U.S. skier, Adam Luban (SVSEF Gold Team) placed second (+32.6), with Canada’s Graham Nishikawa (CPNST) in third (+34.4). Nishikawa races as a guide for Canada’s Para Nordic Team. Len Valjas (CNST) was 39.8 seconds in back of Kennedy to place fourth overall.